At each step you will be able to look for and find a cache. Now it’s time to head to Corso Cavour, one of the most important streets in Novara. 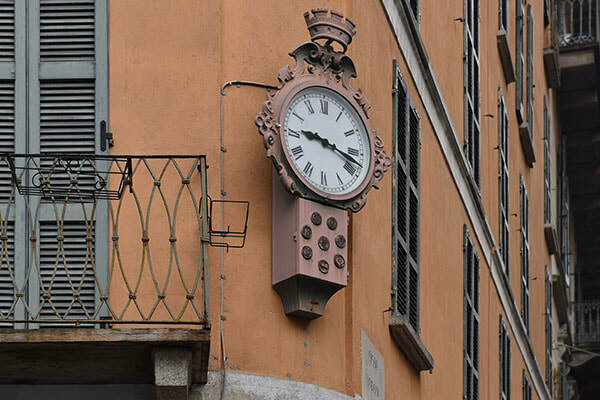 Make a stop at the Angolo delle Ore (the Hours’ Corner or crossroad) from where you can see the Palazzo Natta’s clock tower. In the 1800s at noon all the other clocks in town were set to the palace clock. ​If you look carefully at the top part of the bell tower, you may notice it has a strange shape – actually, it looks like a shoemaker’s working table. The resemblance apparently is made on purpose, since in the past the shoemakers’ corporation was one of the most powerful in the city (still nowadays Novara hosts the Shoemakers’ University). The “Angolo delle Ore” crossroads (“The Hours’ Crossroads”, between Corso Italia and Corso Cavour) is part of the history of the city because when Corso Italia was still named Corso di Porta Torino, at the beginning of the street there was the famous Caffé dell’Amicizia (Friendship Café). The coffee shop was taken over by Gaspare Campari in 1856. The man was happy: he set on tables in the street, lots of people became regulars and he started making experiments creating new drinks, cocktails and aperitifs. He gave his inventions exotic names like Long Life Elisir, Rhum Oil, and Superfine Rose Liquor. One of them soon became his clients’ favourite: it was called "Bitter all’uso d’Hollanda" (Bitter the Netherlanders’ way) and it was going to become famous all over the world with the name of "Bitter Campari". The success brought Gaspare Campari to Milan, in the Vittorio Emanuele Gallery, two steps from La Scala Theater, and Piazza Duomo. Since then, many have tried to copy it, but it is said that the recipe is still a family secret. The Angolo delle Ore is an important place in the city centre also because it stands where in Roman times there was the crossroads between the cardus and the decumanus, the axis along which the Romans built their military camps (the cardus was north-south oriented, while the decumanus was east-west oriented). 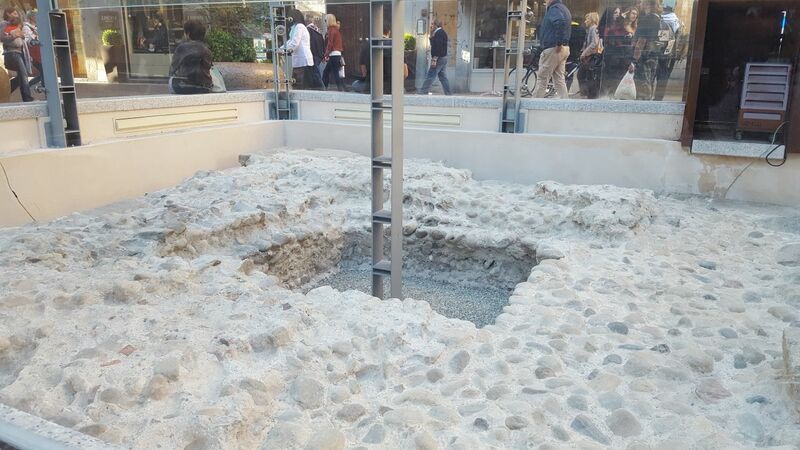 What you can see today under a glass case are the remains of a medieval tower. Still in this place during the Plague that took place in 1630-31 they built a white cross. Next to the cross religious services were celebrated so that people who were confined to their houses could participate. Because of the cross the place was first called “Cantone della croce bianca” (Corner of the white cross). Unfortunately, in 1789, the cross had to be removed because it was considered an obstacle to the passage of the wedding carriage of prince Vittorio Emanuele di Savoia. The cross was placed on top of the St. Peter’s al Rosario church and you can still find it there.